LMR 200 cable type cable(RFCT P/N RLL200) coaxial cable provides good performance for its small diameter of 0.195 inches. It is the same size as RG-58, but with better specifications. Braid and foil. Solid center conductor. 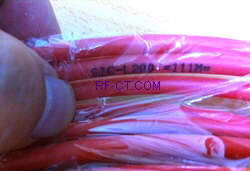 Generally LMR cable show high performance, flexibility and low loss properties. These are usually used for interconnection of module, base station & antenna. Also LMR types of cables offer lower loss and better RF leakage compared with RG cable.